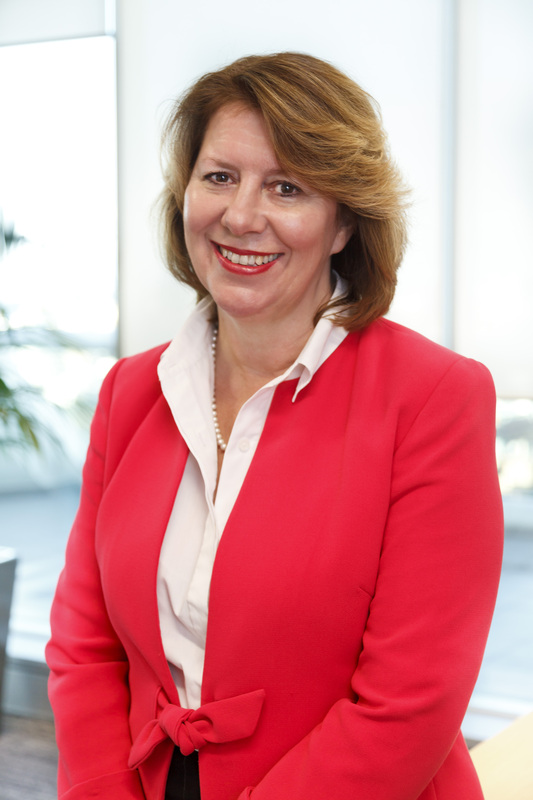 Australian Children’s Education and Care Quality Authority (ACECQA) Chief Executive Officer Karen Curtis addresses the importance of continuous quality improvement under the National Quality Framework (NQF). One of the most important aspects of our system of assessing and rating the quality of education and care services is its emphasis on continuous improvement. This is deeply embedded within the NQF, starting with the requirement for all services to have a Quality Improvement Plan in place. ACECQA’s latest published Snapshot, based on data as at 30 September 2016, shows that, of the 15,429 services approved to operate under the NQF, 83% have been assessed and rated, with 71% rated at Meeting the National Quality Standard (NQS) or above. As you can see from the information above, most jurisdictions have assessed and rated more than 80% of services in their state or territory and the focus for some, particularly those that have assessed and rated more than 90% of services, is increasingly upon reassessing services. When state and territory regulatory authorities undertake quality assessment, the goal is to drive the quality improvement of services, improve outcomes for children and make meaningful information available to families and communities. To make the best use of available resources, regulatory authorities take a responsive, risk-based approach, focussing on services in need of quality improvement. This typically results in more frequent assessments of services that do not meet the NQS, as well as potential reassessments of services that have experienced significant changes or adverse events. As at 30 September 2016, a total of 1332 reassessments had taken place. 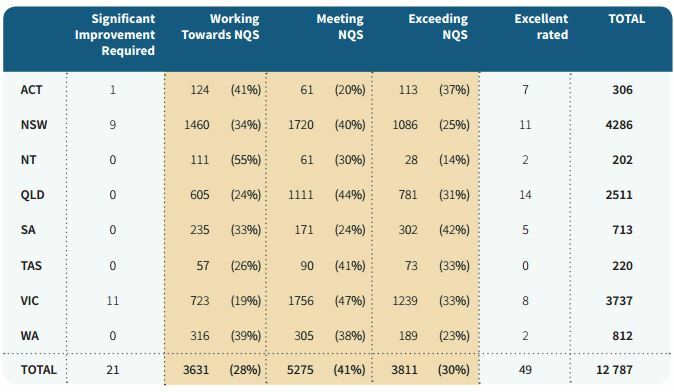 Almost two thirds of these resulted in a higher overall rating being given, with the most common improvement being services moving from Working Towards NQS to Meeting NQS. The NQS is made up of a series of standards and elements and it is at the element level where we get a comprehensive picture of quality improvement. To date, 75% of reassessments have resulted in a higher number of elements being assessed as met. 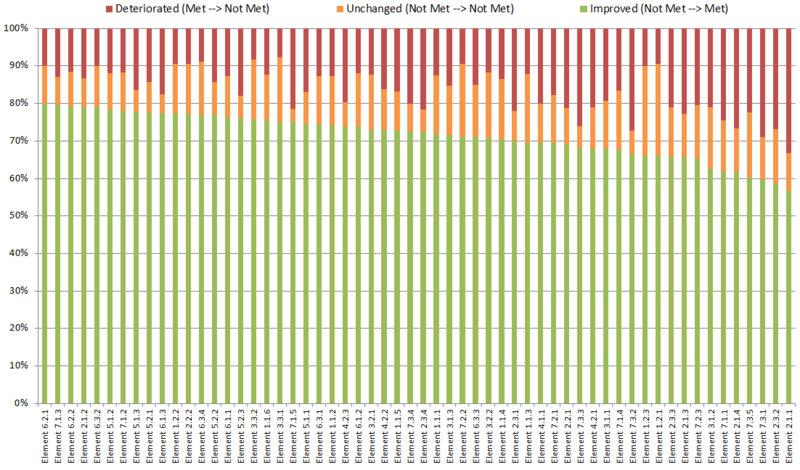 On around 100 occasions there has been a very notable improvement in performance, with 21 or more elements on aggregate moving from being assessed as not met to met. In contrast, just over 10% of reassessments have resulted in a lower number of elements being assessed as met. On seven occasions, there have been marked deteriorations in performance, with 21 or more elements on aggregate moving from being assessed as met to not met. More than half of reassessments have resulted in between one to 10 elements on aggregate moving from being assessed as not met to being assessed as met. 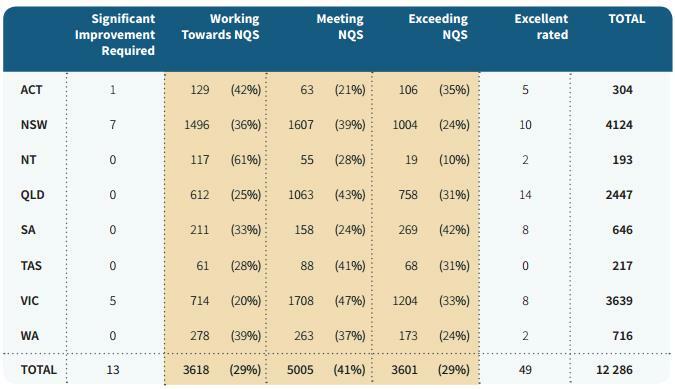 My previous article, which looked more closely at the nature and diversity of the Working Towards NQS rating, is relevant to this, in particular the high proportion of services that are rated at Working Towards NQS due to not meeting a low number of elements. continued to be assessed as not met. Reflecting upon these elements and considering why they appear in the respective lists will help prioritise and direct future quality improvement efforts. For example, it may be that efforts to improve performance against some standards need to be more intense, targeted and prolonged. I also want to highlight that the consistent picture over the last four years is that Quality Area 1: Educational program and practice is the most challenging of the seven quality areas, with Standard 1.2 (focused, active and reflective educators and co-ordinators) and Standard 1.1 (curriculum enhances each child’s learning and development) the most challenging of the 18 standards, and Element 1.2.3 (critical reflection) and Element 1.2.1 (ongoing cycle of planning, documenting and evaluation) the most challenging of the 58 elements. Devoting dedicated time to discussing, reflecting on and prioritising aspects for improvement around the educational program and practice, particularly reviewing the feedback received as part of the assessment and rating process, will provide a solid foundation for continuous quality improvement efforts. In my final blog post next month, I look forward to sharing with you my reflections on the last five years, a period of momentous change for our sector. Australian Children’s Education and Care Quality Authority (ACECQA) Chief Executive Officer Karen Curtis addresses a number of questions on what it means when education and care services are rated Working Towards the National Quality Standard. 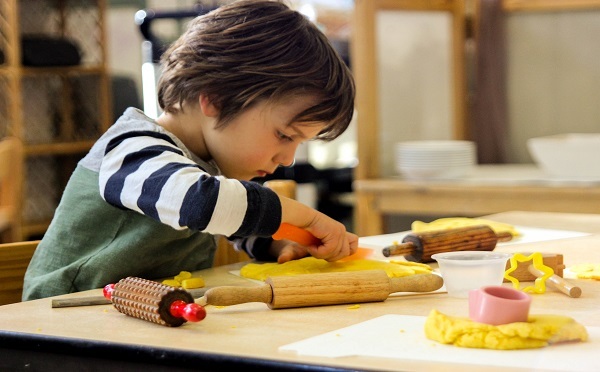 Are 30% of education and care services ‘failing’ the National Quality Standard (NQS)? Are they underperforming? Making progress? Or are they working towards meeting the NQS? Depending on what you read and who you speak to, you may well get a different answer. Of all the rating levels given to services, it is the ‘Working Towards’ rating that has generated the most discussion and conjecture, partly due to the ambiguous nature of the words themselves. With the introduction of the National Quality Framework (NQF) on 1 January 2012 came a new, challenging and comprehensive system of assessing and rating the quality of education and care services around Australia. 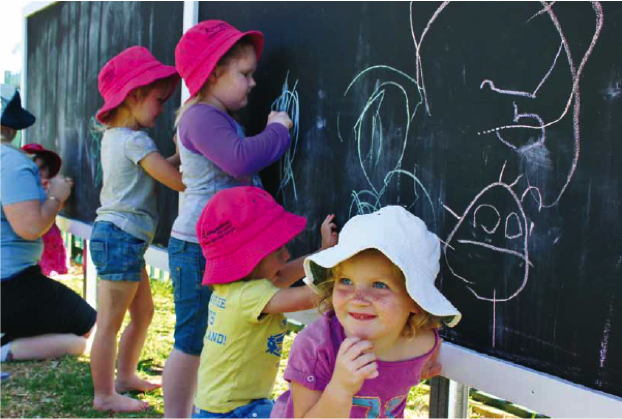 All long day care services, preschools/kindergartens, family day care and outside school hours care services approved to operate under the NQF would be assessed and rated against the NQS. The NQS sets a high, national benchmark for education and care services and encompasses seven quality areas that are important to outcomes for children. Services are rated against the quality areas consisting of 18 standards and 58 elements. are available on the ACECQA website. This system of assessment and rating began in July 2012 and ACECQA publishes quarterly updates about progress and performance against it. Our latest NQF Snapshot, based on data as at 30 June 2016, highlights a couple of milestones. Of the 15,417 services approved to operate under the NQF, 80% have been assessed and rated, and 70% of those are rated at Meeting NQS or above. To be rated Meeting NQS, all 58 elements of the NQS must be met. This is a high bar and means that a service may be rated at Working Towards NQS if they are not meeting anywhere between one or all 58 elements of the NQS. There are over 1,000 services rated Working Towards NQS because they are not meeting three or fewer elements of the NQS. And over 2,000 services receive it due to not meeting seven or fewer elements. At the other end of the spectrum, 300 services receive the rating due to not meeting 24 or more elements of the NQS. Detailed results are available on the ACECQA website. By examining the element level performance of services rated at Working Towards NQS, we get a much better idea of what, and how much, work needs to be done, and how close services are to meeting the high standard set by the NQS. Over the years, ACECQA has published more information about the assessment and rating process. We do this for a number of reasons, including to help families and carers make informed decisions, and to educate and inform the sector about performance against the NQS. In addition to our NQF Snapshots, we also publish comprehensive service level data on NQS performance. This allows anyone to look at the quality area, standard and element level performance of any service that has been assessed and rated. As the assessment and rating process is designed to be comprehensive and transparent, the state and territory regulatory authorities provide detailed assessment and rating reports to services, which includes examples of the evidence that led to their rating decisions. Services will also have a Quality Improvement Plan in place. This plan will identify the work that the service is doing to achieve a rating of Meeting NQS. Alternatively, if the service is already performing at that level, the plan will outline how it will continue to build upon its high performance and look to achieve a rating of Exceeding NQS. For the 29% of services rated at Exceeding NQS, the plan will summarise how that level of quality will be sustained and continually improved. So, returning to the questions that I posed at the start of this article. In my opinion, a rating of Working Towards NQS is not a failure. Not least of all because the assessment and rating process was not designed to be a pass-fail system. Rather, it is a system that examines a broad range of quality measures and encourages continuous improvement. 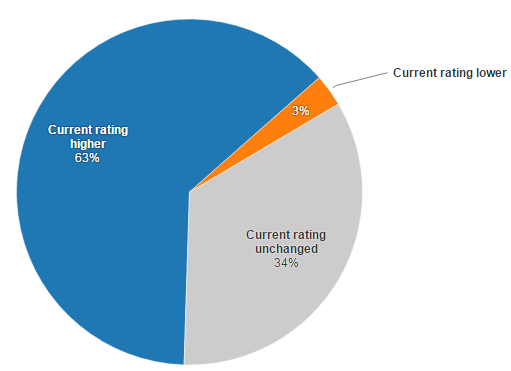 Working Towards NQS is also very far from being a one size fits all rating, as you can see from the figure above. Because all of the relevant information is readily available, I would encourage anyone to look beyond the overall rating, check which aspects of the NQS a service is finding more challenging, and ask the staff at the service what work they are doing to improve on these. A notable aspect of the assessment and rating system is the process of reassessments, particularly for encouraging and fostering continuous improvement, and this will be the topic of my next article in November. Author ACECQAPosted on October 27, 2016 October 28, 2016 Categories ACECQA, NQF, RatingTags Working Towards NQSLeave a comment on What does it mean to be ‘Working Towards’ the National Quality Standard? 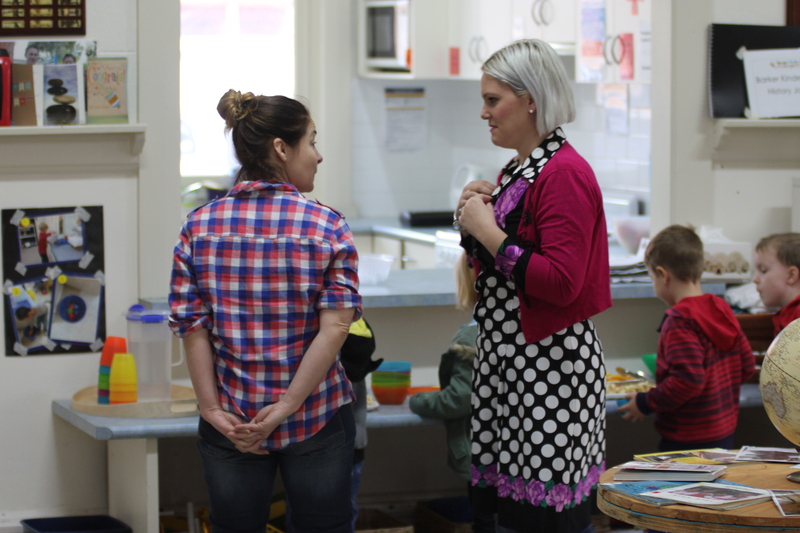 This week on We Hear You, Justeene McKnight, Nominated Supervisor Education and Care Services at Campbelltown City Council, tells us about Amarina Early Learning Centre’s recent assessment and rating journey. On receipt of our letter requesting the submission of the Quality Improvement Plan (QIP), we were nervous. However, as we thought about the process and the standards, we realised we didn’t need to be. The more knowledge and information we gained about the process, the more we realised that we were already achieving many of the elements in each of the seven quality areas and we would just need to demonstrate this to the assessor. We had been working hard to ensure many of our practices were embedded in our daily program and we needed to reflect this in our QIP. We held regular discussions during team meetings by making the assessment and rating process a static agenda item. We used journals to assist us to reflect on how we believed we met each National Quality Standard within our service as a team. We discussed information such as what would an assessor be able to see, feel and hear within our service. Areas that we felt needed improvement were then included within the Quality Improvement Plan. Families also had regular opportunities to share ideas and feedback through our monthly surveys and discussions at our flexible parent meeting. Each child regularly had the opportunity, both individually and in group discussions, to express their opinions, ideas and views about the service, how it made them feel and about the relationships that they had developed at the centre. The children’s ideas and opinions were then included in the QIP as part of our strengths and areas for improvements. We also placed the plan in the foyer so families could track our ongoing improvement and provide feedback on any areas they would like us to focus on. As soon as the assessor arrived, she made all the educators feel at ease. It was obvious through our conversations with the assessor that she knew our service philosophy and had spent some time researching to fully understand our beliefs and practices. This allowed us to feel that the assessor, and the assessment process, was focused on ensuring our service had the opportunity to be unique and respond to our individual children, family and community needs. The assessor spent time discussing our current community needs and what strategies we utilise to support not only the children within our service, but the families and the surrounding community also. She looked at our environment indoors and outdoors and asked questions as to why certain things were the way they were. For example, we discussed how we had created a kitchen in the 0-3 year room out of a recycled TV unit, as part of our sustainability management plan. This opportunity to discuss our environment allowed the assessor to understand our practices, as well as the vision and philosophy of the service and organisation. She spent time interacting with the children and held several discussions with staff. During the visit, we felt that we had the opportunity to showcase our service and point out what we feel we do well, what we would like to spend time working on and how we implemented our philosophy for the best interest of all stakeholders. At the end of the visit, we had adequate time with the assessor to go through the report and a further opportunity to show or demonstrate any other information or evidence to support our assessment visit. When we received the draft report, we found it very useful to reflect on the assessment and rating process, as well as our practices within the service. The assessor provided feedback that we were able to incorporate into our QIP to ensure that we can continue to improve our practices and our service delivery. Regular consultation with children has now become embedded into the practice at Amarina Early Learning Centre. This provides them the opportunity to have their voices heard and integrate their ideas and opinions into the philosophy and every day practices at the service. The report also validated that the service’s philosophy was evident within our everyday practice and that what we had hoped to be evident to the assessor had been observed. Once our final assessment and rating report was received confirming our rating of Exceeding, we began gathering evidence to apply for the Excellent rating. It provided an unbelievable opportunity to reflect on our position within the community, as well as our practices within the service. The application process was thorough and required us to gather examples of how we demonstrated excellence in three separate criteria, and that we had a clear vision for what we wanted to achieve within the service, the community and within the education and care services sector in the future. As a team, we spent our time ensuring the application was the best it could be and included supportive attachments. The day that we were notified of our Excellent rating was rewarding – not only for the organisation and the staff members, but also for the families and the community. It validated that their contributions to our service were valued and noticed not only by the service and the organisation, but also by ACECQA.